Converse Basin is a sequoia grove located in Sequoia National Forest in the Sierra Nevada in eastern California, in the edge of the Kings Canyon, 5 miles (8 km) from General Grant Grove in Kings Canyon National Park. 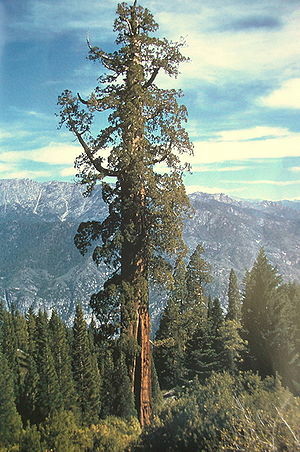 It includes the Boole tree, the sixth-largest tree in the world. 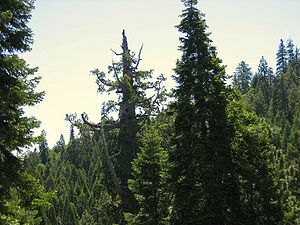 Converse Basin was logged of most of its giant sequoias between 1892 and 1918. Now only perhaps 60 large specimens survive out of thousands. The grove is composed of thousand of young small sequoias. This grove is the largest contiguous grove in the world and contains Boole Tree, the largest sequoia on National Forest System land. This grove offers unique opportunities to study how rapidly the young sequoias grow and to create timelines from tree rings on the stumps. It is fairly easy to get to by car, but the main access is a dirt road. It is best to visit in the summer when the road is dry, or in the winter by crosscountry skis or snowmobile. The grove is about 3,700 acres (15 km2) with sequoias concentrated in the basin formed by Converse Creek. 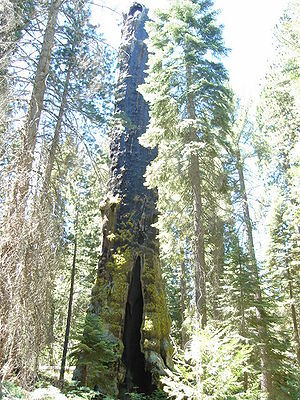 Boole Tree: This tree was originally thought to be the largest tree, but after measuring many other specimens it was rated at number 6, with a volume of 42,472 cubic feet (1,202.7 m3). This tree has an enormous base, with a girth of over 113 feet (34 m). The tree is 267 feet (81 m) tall. Muir Snag: Thought to be the oldest giant sequoia, this now dead tree is still standing but only at 140 feet (43 m) tall. It has a maximum base diameter of 35.9 feet (10.9 m) and before it died its perimeter could have been as much as 110 feet (34 m). This tree is thought to be between 3000 and 3500 years old. You can reach Converse Grove from State Highway 180 or General's Highway (State Highway 198). Take Highway 180 about 5 miles (8.0 km) north of General Grant Grove village to the Converse Turnoff (Forest Road 13S55). There is a sign at this point saying Converse Grove, Stump Meadow and Boole Tree Trail. Take Forest Road 13S55 about 0.5-mile (0.80 km) into Converse Grove. If you want to go to Stump Meadow, continue on Forest Road 13S55 past an intersection until you arrive at the meadow. You can continue on this route to Boole Tree Trail, which is at the end of Forest Road 13S55.